Half out of financial necessity and half because I want to live a more natural lifestyle in general, I decided recently to start making my own beauty/body products (body wash, shampoo, lotions, etc.) After much online research I discovered that it’s incredibly easy to make most of the items I use in my daily routine and I love knowing exactly what’s going onto my skin. The first thing to tackle – oil cleansing for the face. I was just about out of facial cleanser so it was the perfect time to take this on. My skin happens to be quite sensitive, so I was concerned with how this method would effect my face. I read that the first few days of oil cleansing can cause some initial breakouts so I had to plan accordingly (nothing in my social calendar for a couple days). I came across numerous websites online with different formulas, but there was something about My Merry Messy Life that I liked so I followed her “recipe” closest. Plus, she was very quick to respond to me when I asked about using the oil to remove eye makeup (the answer is yes, you can, BTW). On her post she gives the ratios of oils to use for your skin type which is also incredibly helpful. Play around with it though until you find the right combo that works best for you. 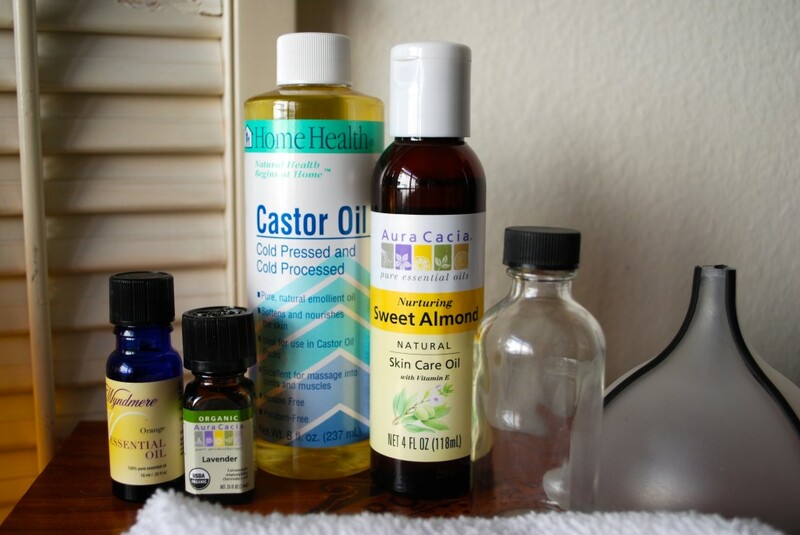 The process is simple: dampen a wash cloth with hot water and massage a small amount of the oil all over your face. Lay the hot cloth over your face and let it cool while the steam does it’s magic. Then use the wash cloth to gently wipe the oil from your face. You probably won’t need a moisturizer after this but if you tend to be dry rub the tiniest amount of the oil into your skin after. I’ve been doing this for a couple weeks now and my skin feels and looks fantastic! The stupid blackheads I have been battling my entire life are starting to disappear and my skin feels incredibly soft. Plus, because you use so little the overall cost is SO CHEAP! Next I’m going to make my own body lotion so stay tuned!! *This post includes affiliate links, purchases made through those links help fund this blog!